Today's growing businesses rely more on their network to carry out missioncritical business activities. Deployment of VoIP and IP surveillance needs the network intelligence to separate the voice and video traffic from data, and prioritize them accordingly. However, companies do not necessarily have more money or advanced training to deal with complex managed switches. NETGEAR ProSAFE Gigabit Plus Switches meet this growing need by providing fundamental network features such as VLANs, QoS, and IGMP Snooping that will help optimize the performance of business networks. ProSAFE Plus switches come in a variety of configurations ranging from 5 port desktop to 24 port rackmount. Certain Plus switch models support Power-over-Ethernet (PoE) and can power devices such as IP phones, IP surveillance cameras and wireless access points with just an Ethernet cable; perfect for low cost PoE deployments. ProSAFE Plus Switches are the perfect upgrade from the plug-and-play unmanaged switch, delivering essential networking features at a very affordable price. 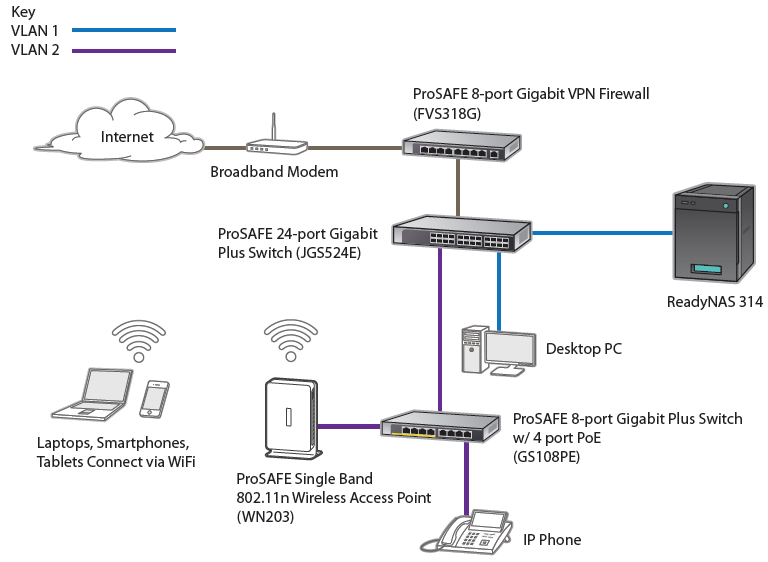 Download the NETGEAR Prosafe Plus Gigabit Switches Datasheet (PDF).